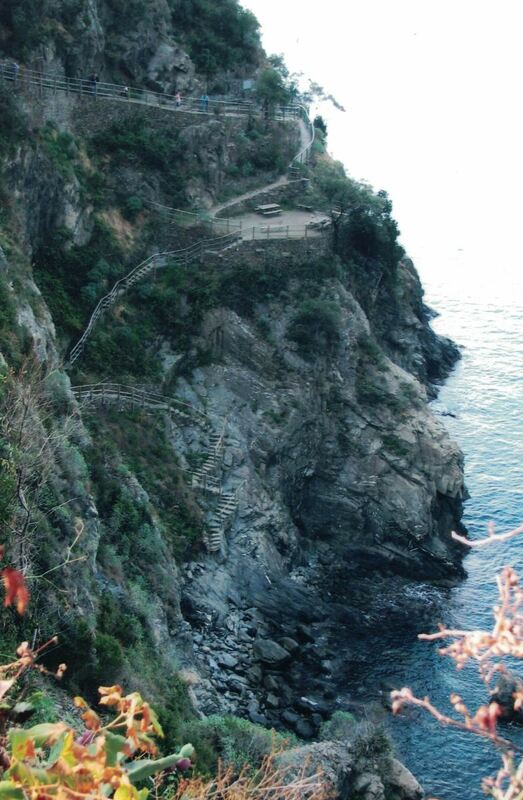 In Autumn 2006 I hiked the Cinque Terra trail—a footpath on the rugged northwest coastline of Italy. I'm glad I wore my hiking boots. The path from Corniglia to Vernazza is narrow and precarious. To my left is a steep hillside of boulders and stacked rock; on my right are jagged rocks hugging the rugged coastline. Nothing but a fragile railing separates hikers from that dangerous cliff edge…and a plummet of 700 feet to the Ligurian Sea. My husband and I are walking the sinuous cliffside path of The Cinque Terra. The Cinque Terre (Five Lands) is five small coastal villages on the west coast of Italy. The southernmost town is Riomaggiore, a fishing village originally settled by Greek immigrants in the 8th century A.D. Terraced hillsides dotted with grape vines and slate-roofed houses speak of the Greek influence. In the early 20th century a railway was constructed to link the five towns of the Cinque Terra to one another. To aid the construction workers in moving back and forth along the first segment, a path was excavated. One hundred years later that same path is used today by tourists; it’s the easiest part of the trail, with magnificent views of the sea. It is here that romantics leave “locks of love” on the fence overlooking the blue waters below. The locals call this place “Via dell’Amore”, the Walk of Love. Next is Manarolo, the oldest and second smallest of the five villages. Her primary industries are fishing and wine-making. Unlike her sister villages, Corniglia does not overlook the sea. Brightly-colored four-story houses outline the narrow streets and alleys, and are little changed from the scene described by Boccaccio in his “Decameron,” a 1353 A.D. compendium of 100 tales shared by ten travelers who banded together to escape plague-ridden Florence. Monterosso is the northernmost town; its beach, boardwalk and luxury hotels have earned it the nickname “Italian Riviera”. 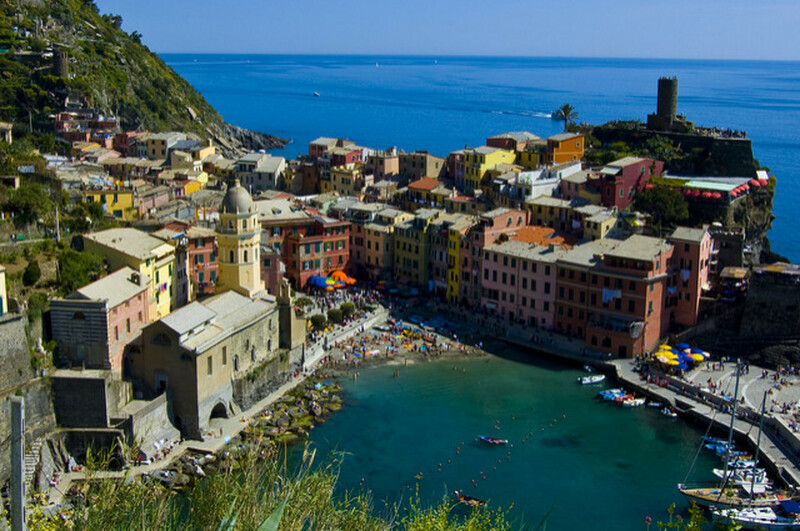 Tucked securely in between Monterosso and Corniglia is Vernazza. Vernazza is described in guidebooks as "a quaint little fishing village", but it’s so much more than that. Colorful homes cling to the cliffs. A lovely harbor nestles under the shadows of an ancient castle. The hills are dotted with ancient olive trees and wine-producing grape vines, still tended by hand, on steeply terraced slopes. Most of all, Vernazza is about putting aside the frantic pace, inhaling deeply, and taking life at a slower pace. Vernaza was my favorite, my haven of leisure from the press of tourist-crowded museums and galleries. We stepped off the train at Vernazza in mid-afternoon...and stepped into another world. There are no cars in Vernazza. No traffic. No horns blaring—just the pleasant sounds of people laughing and talking and merchants bargaining with townsfolk and tourists. A gentle sloping cobblestone road leads through the center of town past storefronts and apartments. Within 10 minutes we arrived at Trattoria Gianni. Whitewashed steps led to the room we had rented for the weekend. We hastily unpacked, and then descended the steps to the plaza. Five hundred feet away was the sand, the breakwater, and a view of the Ligurian Sea…which becomes the ocean…and becomes forever. As evening approached we sat at a table in the courtyard of Trattoria Gianni. Our meal began with a basket of crusty bread, and a bottle of Gianni’s family wine. 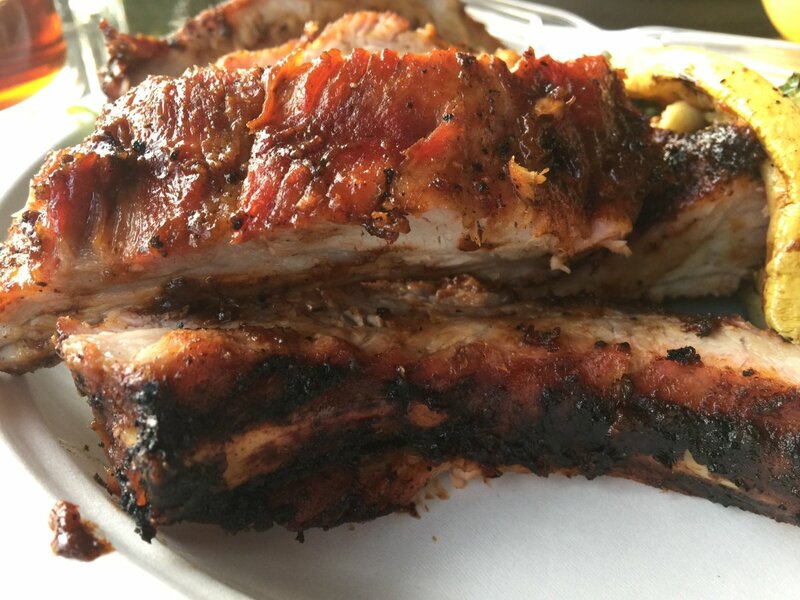 We asked our server for his recommendation; he said "You must try the trofie." And it is then that I had my first taste of pesto. It was love at first bite. 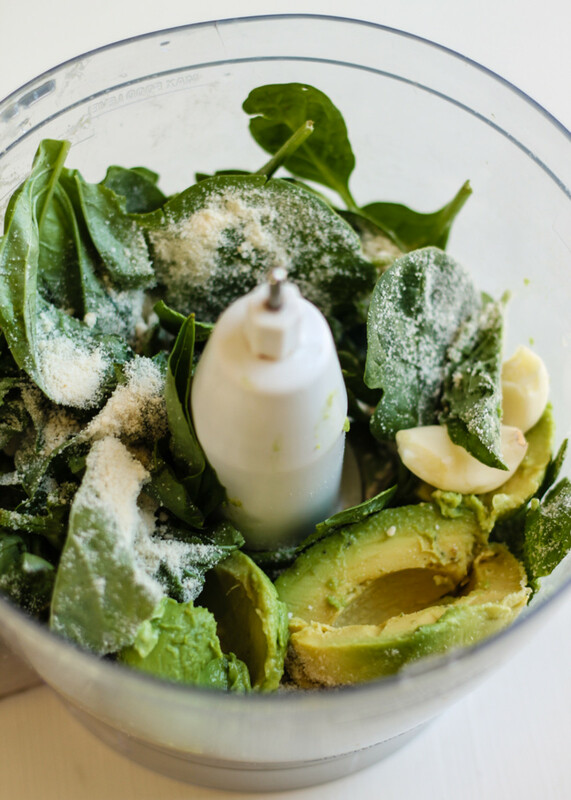 Place basil, walnuts, and garlic in bowl of food processor. Pulse into finely chopped. 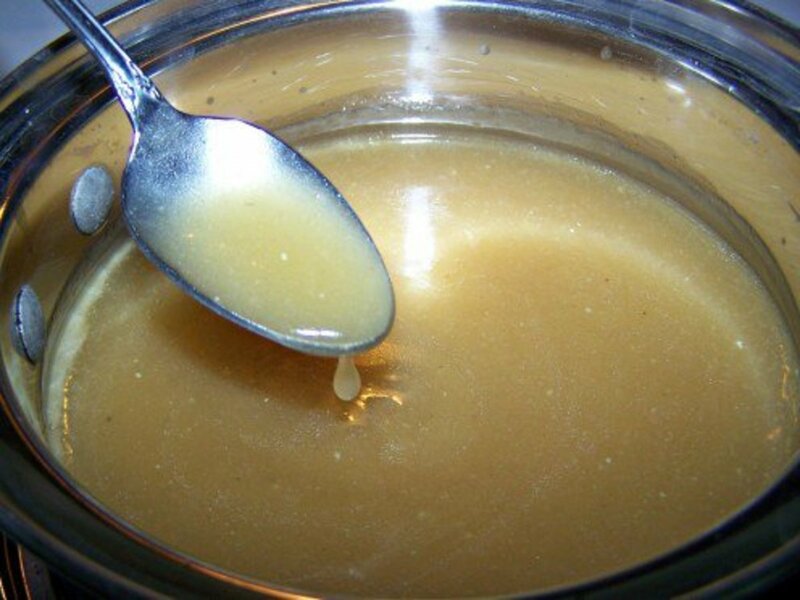 Add oil, cheese, and salt and process until a smooth paste, stopping several times to scrape down sides of bowl. 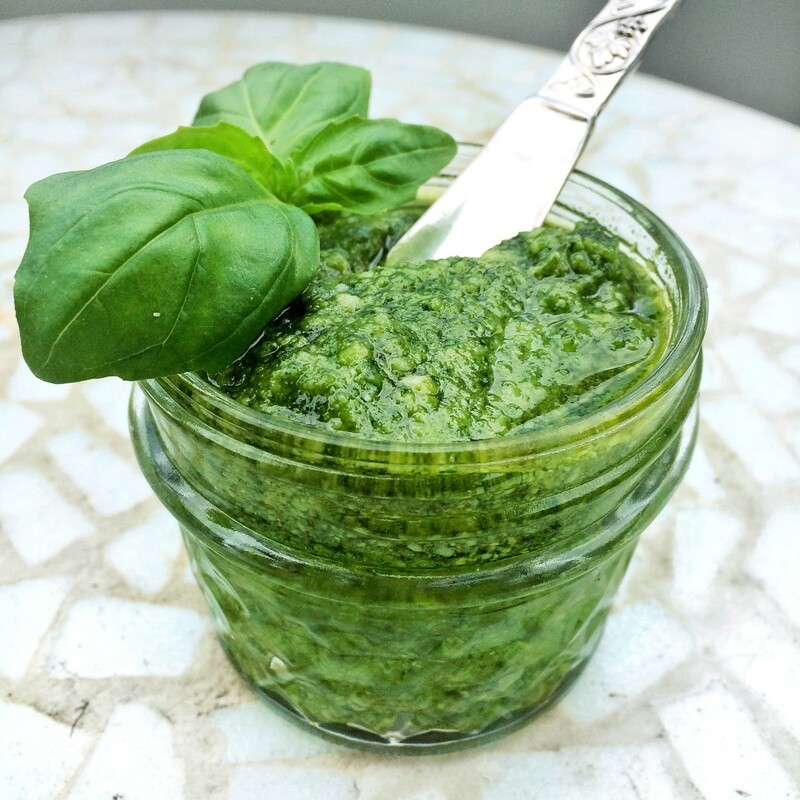 Monique is the author of Ambitious Kitchen, a health-focused food blog and the creator of this no-oil basil pesto. 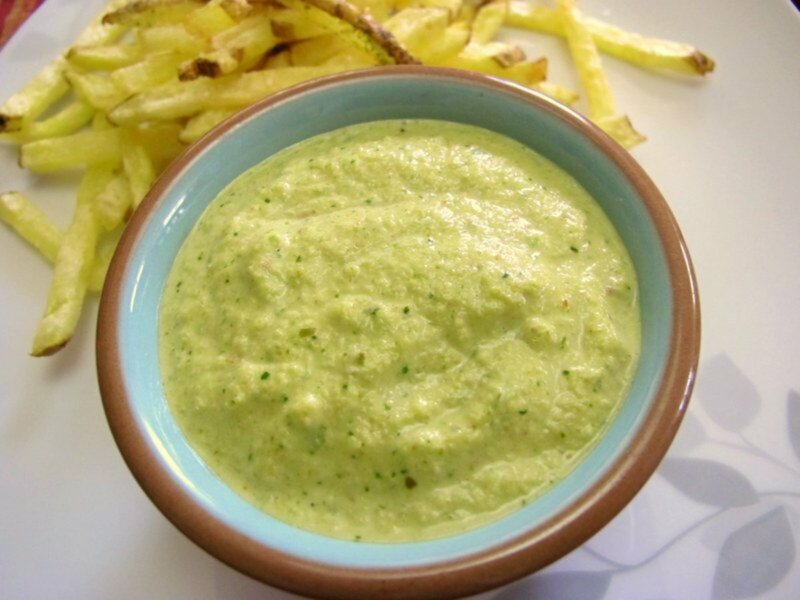 The creamy flesh of the avocado subs for olive oil creating a fresh pesto so yummy you'll want to use it as a dip. Avocado does tend to darken (remember what happens to guacamole) so this version is not well suited for freezing. Kaylie is a 21-year old food stylist, photographer, and the creator of the blog paleoglutenfree.com. She makes a killer kale pesto (a powerhouse of nutrition). But that's not the end of the story. This stuff is also paleo and dairy free. Although kale lacks the anise flavor of basil, it has a similar earthy quality that pairs well with pasta. Bring a large pot of water to a boil (at least 4 quarts). Drop in the potato slices and cook until almost tender—about 2 minutes. Lift out with a skimmer and set aside. Next, drop in the green beans. (Remove the stem end and cut in half—leaving the blossom end intact.) Cook about 2 minutes or until tender-crisp, remove with a skimmer and set aside. Add the pasta to the simmering water and cook according to package directions until al dente. Return the cooked potato slices and cooked green beans to the pot—wait 15 seconds, and then drain. 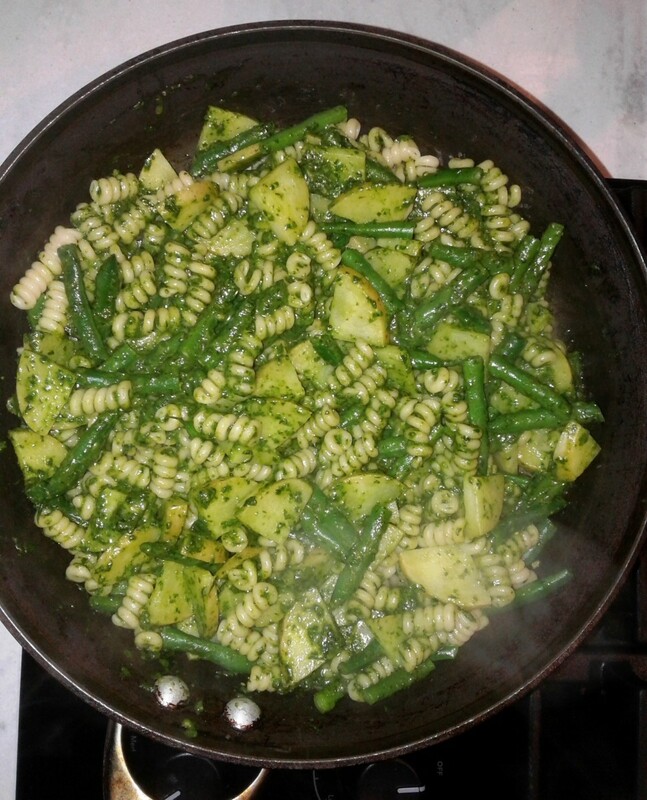 Put the pasta/potatoes/green beans mixture back into the pot and mix with the pesto. Pour into a serving bowl and top with grated Parmesan. Toss and serve. If possible, use the smallest leaves (from the top of the plant). The larger (older) leaves have a stronger taste. Don’t use garlic that has begun to sprout. The green shoot is bitter. Gently wash the leaves and dry with a salad spinner. Don’t soak and don’t blanch in boiling water. Pesto will keep for up to one week in the refrigerator; allow to return to room temperature before using. A thin layer of olive oil poured on top of leftover pesto will keep it from darkening. Here is a link to simple instructions on how to freeze your pesto for later. Never run out of Pesto again! 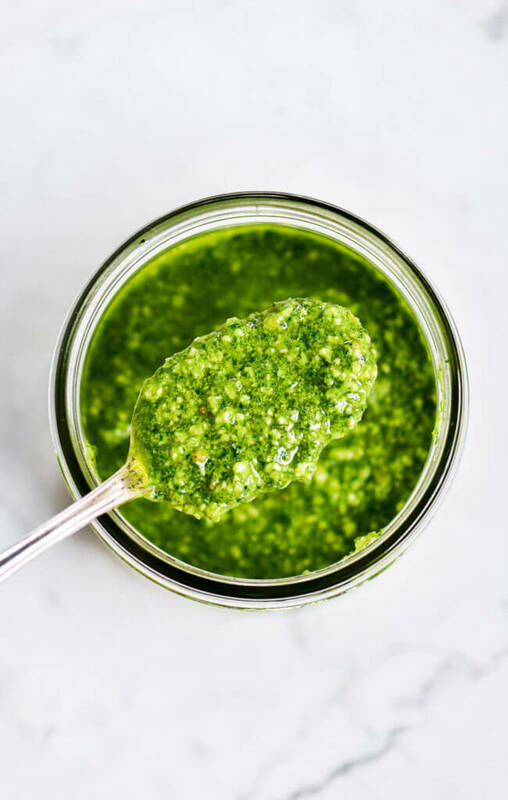 Pesto is so simple to make, and I've got such an easy little trick for How to Freeze Pesto - it works like a charm! Eric, do you want an article (hub) about paella, or just a brief discussion (in my Q&A column), or do you want me to share my recipe? Excuse me for butting in but I did not want to forget to ask you about Paella. I think Valencia was where I hung out with Paella for 1$ for all day meals. A bit of something (fresh catch) stirred in before breakfast, lunch and dinner. Sorry to say but a little too much Heineken España mixed in. 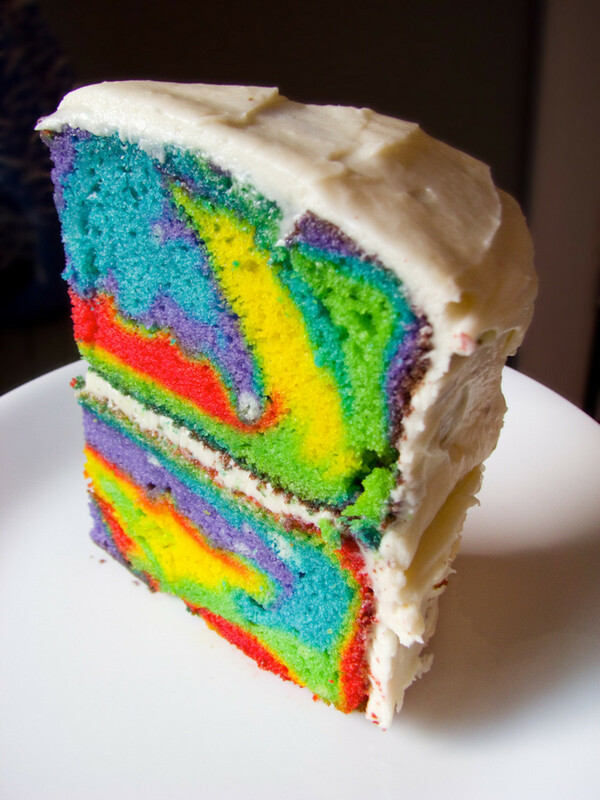 Maria, I hope you enjoy it. Thank you for stopping by. I hope you'll find the time to read more of my recipes. the one with avocado looks yummy and interesting...I might try it soon too.. Thank you Shauna - I am glad you were able to join me on this trip. You know me--I love to tell stories. That's what makes the food really memorable. Linda, I absolutely love the introduction to this article! I've never been to Italy, so I really enjoyed the picturesque trip you took me on before reading your delicious recipes. Okay...:). You've convinced me to try it as is, but thanks much for the ideas. Looking forward to trying this out. Am growing basil in pots right now and have already started several new plants from cuttings. RTalloni - The pesto/pasta/potato/green bean dish is VERY nothern Italian--it's a famous dish. Of course you could simply omit the potatoes and use just pasta and green beans. Or...some sauteed mushrooms would be good or cooked diced chicken breast. Thanks much! I need this recipe and freezing info. Wondering about switching the potatoes...never had potatoes and pasta together...thinking of less starch. Any ideas? 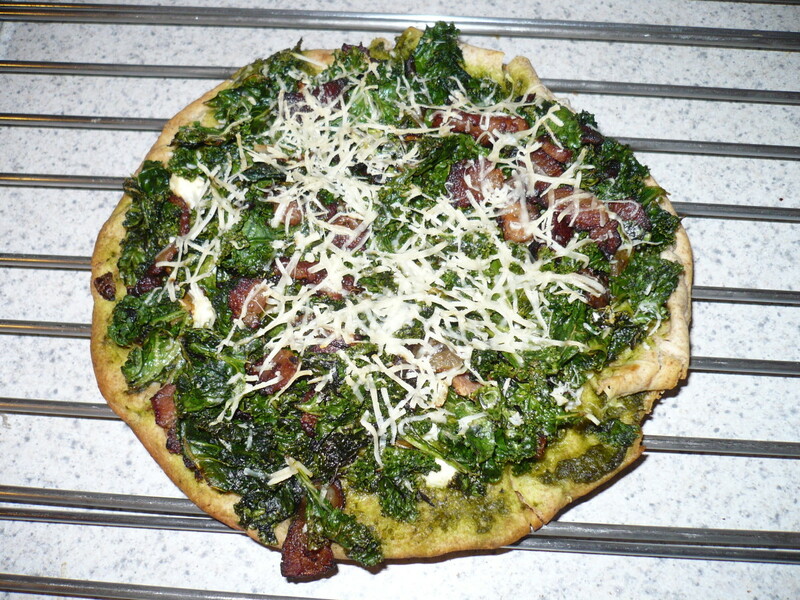 Thank you Lena - if you are swimming in kale, try the kale version shown here. It will not disappoint. I hardly ever make basil pesto anymore, since I'm almost always swimming in kale from the garden, but yours looks beautiful! Bill, I can't imagine what about the beautiful green color of pesto turns you off, but I guarantee if you just closed your eyes and tasted a bit of it on the tip of a spoon you would SWOON. Give it a try my dear. Mary - If you can't find basil give the kale pesto a try. It's not the same, but still has the garlic-y punch. If you go to Italy for ANY reason you will not be disappointed. But yes, do go for the food. I am in love with the cuisine of Northern Italy (as you can probably tell by how many times I write of it). I love pesto but I can't seem to get basil to grow here. I don't want to buy pesto in a jar because it just doesn't taste the same. There are four types of basil here in Brazil, so I am going to persevere until I get it right. I would love to visit Italy, it is on my bucket list and although I'd love to see the architecture and art, the main reason I want to go is for the food! Flourish - I can't believe you have never tried pesto. Oh please, give it a go. If not on pasta, then on a mild fish, some chicken. Goodness, I've even been known to drop a dollop on cottage cheese. It is herby and rich with garlic. Now billybuc on the other hand is (I fear) a hopeless case. I don't think I've ever had it. The color turns me off for some reason but hey, it was a great story, and interesting information, so I still got something out of this, as I always do. Your writing is simply splendid and makes me want to try pesto! Well Eric, I know that pesto is not a Vietamese thing, but basil IS used in Hmong cooking. I'm thinking right now of some amazing meals I have enjoyed at my favorite Thai restaurant. And now I'm thinking about your over-50 heart being "aflutter". Oh dear! Take it easy my dear brother. I would love to know which type of pesto you prepare, how you use it, and the reception it receives from your adoring family. You are not telling me about that fantastic oil that went into the bread. Now you are telling me about fully basil pesto. My heart is a flutter for this goes so well for us fat men over 50. I am in love with your love for the life made more full for food. Pesto tomorrow night for my family that from their Vietnamese origins will look me funny until eating.